Yeti coolers are some of the best made and world renowned coolers around. They’re perfect for barbecues, hunting, camping, fishing, and so much more. Coolers should be an essential part of your gear list. However, although people want the performance of a Yeti cooler, they don’t always want to have to fork out several hundred dollars for one. That’s a huge expense for a cooler, especially if it’s a gift and even if you do need one that performs well. Yeti brand coolers look great, and are said to have ice retention capabilities of around 10 days. However you need a fair bit of disposable income if you’re going to spend that much. Don’t worry though! If you’re on the look out for coolers like Yeti but cheaper, then you might just find what you’re looking for in this article. Here, we review 3 of the most popular coolers like Yeti all for under $200. Take a look at the pros and cons and see which one sounds right for you. So what do coolers like Yeti look like? 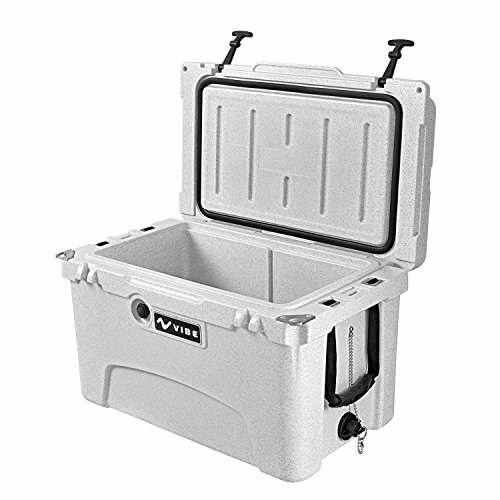 Yeti coolers are renowned for their almost bomb proof rugged construction. You may have seen the numerous video’s on YouTube with products being dragged behind a pickup truck, just to illustrate their toughness. The reason Yeti coolers survive those kind of tests is because of the high specification. Full length hinges, strong lid latches and fittings as well as thick side wall construction all contribute to the overall build quality. Can these cheaper offerings live up to the same standards? If you want the performance of a Yeti then the ice retention needs to measure up. Some Yeti coolers offer up to 10 days cooling in the right environment. This is largely down to the rotomolded construction and perfect fit gasket. 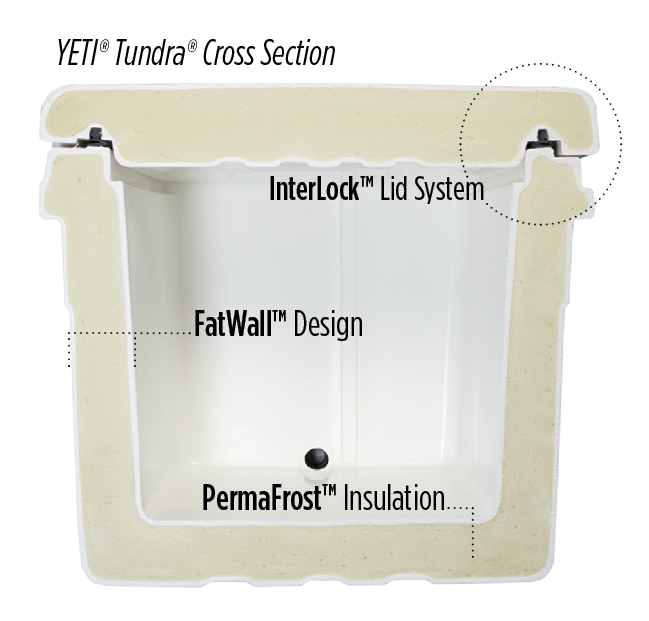 The best coolers like Yeti should incorporate rotomolded insulation. Since the reviews below are ultimately of cheaper units then perhaps we shouldn’t expect quite the same performance. What we are really judging is value for money. If you could get 7-8 days ice retention from a cheap yeti cooler alternative would you go with that product? What about 5-6 days of cooling? At what point is a cheaper cooler just not worth the downgrade? Living up to the specs above might be a tall order. Lets see if we can discover coolers comparable to Yeti at a more affordable price. This cooler is 54 quart, with side handles and a heavy duty design. It is said to hold ice for up to 4 days at 90 degree Fahrenheit, although some claim that it has retained ice for much longer. This will largely depend on the external temperature and what activity you’re doing with the cooler. The orange and brown color is nice and makes it easy to see the ice. The Igloo Super Tough cooler will hold ice for days in extreme heat, which is why it matches up to Yeti so well. The latch and hinges are great quality, and the cooler has an overall great design. This is a cooler that is well built, although probably not as rugged as a genuine Yeti cooler. You can use this cooler several times a month and it will continue to perform well over time. It’s perfect for use on fishing boats, but can have a variety of uses on top of that. You can even sit on it if you like, but you just need to be mindful of the weight that it’s bearing. 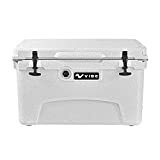 There are many 5 star reviews for this cooler on the likes of Amazon so we’re not the only ones who think it matches up to the Yeti well. This makes it a very good investment for the price. You can purchase this cooler in cool alpine grey, and if you’re lucky with stock you can get the version in camouflage too. A nice touch is that the Vibe Element cooler has built in bottle openers. A useful additional feature that can save you some hassle on your camping/fishing trip. The functionality of the Vibe Element cooler can also be extended further with a basket or divider. This is ideal if you want to separate your meat or food provisions from the all essential beer. It also suggests that this manufacturer is busy trying to improve and get the best out of their products. Ultimately Yeti coolers are held in such high esteem largely because of their cooling performance. This is thanks in part to their rotomolded construction. The Vibe cooler 45 also has rotomolded construction with thick 3″ walls and a freezer style gasket to seal the unit. Cooling performance will obviously differ depending on which part of the US you reside in. We found that for the most part this budget cooler is capable of holding ice for 3-7 days which will be plenty for most users. Considering this is approximately half the price of a Yeti, it represents great value for money. If you’re traveling any distance and perhaps climbing any altitude you’ll also appreciate the altitude pressure release valve. This seemed to work pretty well for us though admittedly we only tested at a few hundred feet above where we live. Likewise the drain plug worked well on our test unit but some previous reviewers has highlighted the fact that it wouldn’t tighten properly and could leak. Some people say this works better than a Yeti, and we’re inclined to agree. The Vibe Element is more than worth the cost at less than half the price of a Yeti cooler for the performance you will get. Why spend several hundred on a Yeti when you can get a cooler that performs like this for less than $200? Even those who have had Yeti coolers in the past say that this performs just as well if not better than one. The only qualm you may have with this cooler is that it is large on the outside, and probably a little smaller than you would expect on the inside. That’s down to the thickness of insulation built in. If you do need plenty of room internally see these wheeled alternatives. The Vibe still works a treat and you’ll no doubt be impressed with the performance and additional features like the bottle opener. 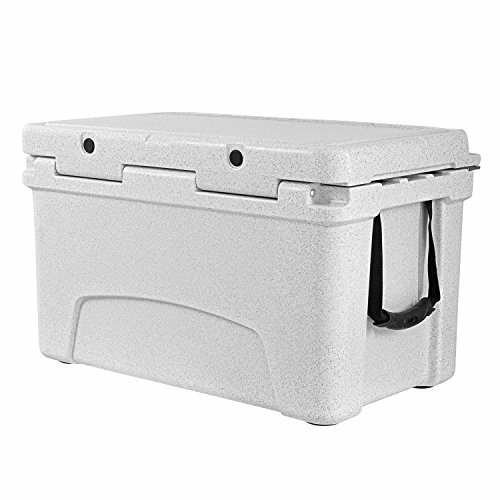 This is a beige, heavy duty cooler that claims to keep ice for up to 7-10 days. It has stainless steel hardware, and also claims to be bear resistant, just like a Yeti. That being said, there are many conflicting opinions out there on this Palm cooler. Some quite like it, some think that it leaves a lot to be desired. The Palm like the Vibe is also rotomolded but unfortunately not to the same standard. For starters this is only 2″ thick, fair enough for a cheaper option. The real problem is with the quality of fit and finish with this unit.The flat gasket doesn’t mate well all the way round the lid. This is also evident with the gaps which can be seen where the corners should meet. It seems this product is ticking the high end features but not competently executing them. 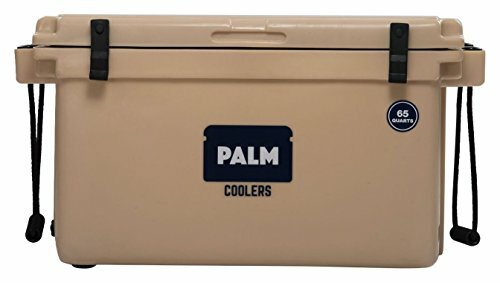 Although this Palm cooler performs OK for some, it is obviously not as cost effective or worth the price of the other coolers on the list. Some people do like it, but you can’t guarantee that it’s going to be a good buy for you. It’s probably much safer to purchase one of the coolers with majority 5* reviews for a similar, if not cheaper price. You might get lucky with this cooler, but we can’t guarantee it. Conclusion – Which of these Coolers is Similar To Yeti and Worth Your Money? All of the coolers on this list have good points, however, the clear winner is the Vibe Element 45Q Cooler, without a doubt. Anybody who buys this cooler struggles to find bad things to say about it, and at half the price of a Yeti, you really cannot complain for the quality and ice retention you get. This Vibe cooler review has revealed a real gem of a product. The Vibe is well built, looks great, and a brilliant cooler for just about any activity, whether you’re fishing or camping. Many people compare it to the Yeti, and we believe that it’s just as good. You won’t find a better Yeti like coolers to spend your money on for under $200! 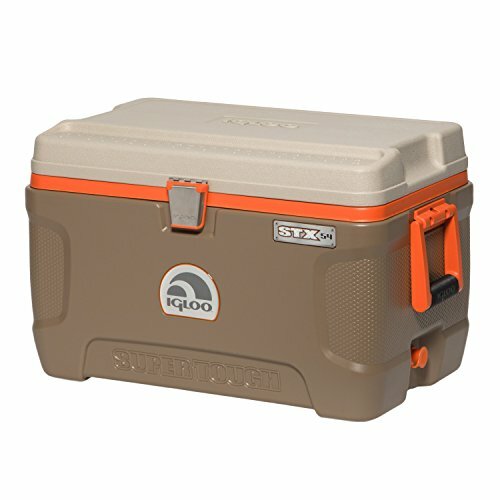 The Igloo Super Tough STX Sportsman Cooler is our chosen runner up. It’s still a great cooler, and still has great features, although it is not quite as robust and high quality as the Vibe Element. However, the Igloo tends to be cheaper, so if you really need to scrimp and save, it could still work for you as a great, sturdy, all round cooler for any purpose. The Palm Coolers PC 65 claims to be like Yeti, but doesn’t quite match up to the other coolers on the list. It can keep ice for a good few days, however, it’s heavier than Yeti, prone to leaking, and can warp easily depending on what you do with it. It doesn’t really give you value for money for the performance, although some people who use it do say that they like it. 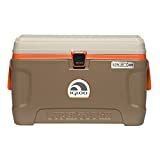 This could be an OK cooler for those who don’t plan on camping/fishing/barbecuing very often, and just want something simple to use. That being said given that the whole point of these 3 reviews is to find coolers similar to Yeti that offer better value for money you could probably buy something that performs better for a cheaper price still. If you’re serious about buying a great cooler, then the Vibe Element 45Q Cooler is a wonderful choice for less than $200!